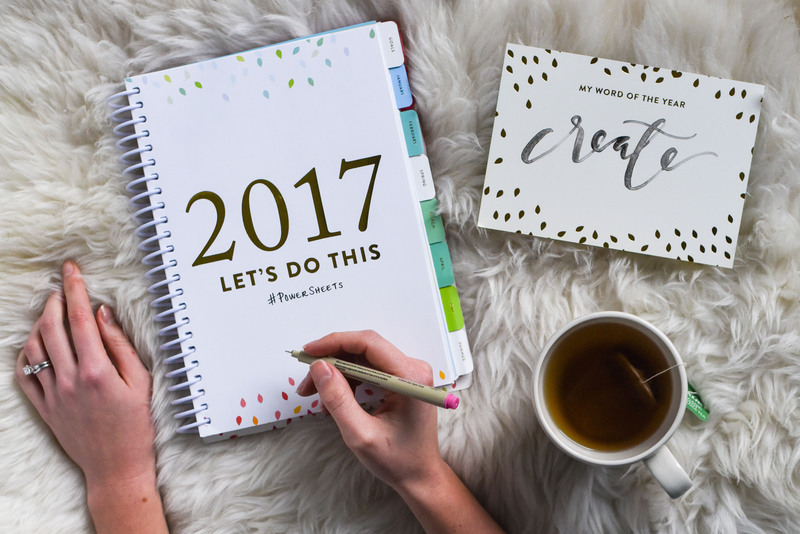 My 2017 Goals + Powersheets Giveaway! The great thing about Powersheets is that you can use it for professional or personal goals (or a combination!). After naming your goals and writing actionable steps for each one, you make your way into the month-by-month sections. Each month, you choose monthly, weekly, and daily goals/actions. I think that feature will be key for me not forgetting about all of my resolutions. Seeing the checkbox for each day and week is totally going to motivate me to check them off. Plus, there are pretty stickers! They are completely sold out of the full year 2017 planners, but luckily for one of y’all, I ended up with an extra copy (purely by accident)! I’m giving a copy away on Instagram (giveaway open January 5-8, 2017). Head over there for your chance to win! It’s no surprise to me that I came up with 8 goals. Yup, EIGHT. They’re a blend of personal and professional goals, and hopefully not *too* ambitions. But I’ve gotta shoot for the stars, right? I want to continue to establish myself as an expert in local food/seasonality, hospitality, and travel. This means curating my blog and social media content to represent me as a brand and to seek opportunities to connect with people offline. I started this painting series almost four years ago, and I’m finally ready to make some progress on it. I see it as a platform to talk about local agriculture and the disconnect between producers and consumers of food. And it puts my college painting degree to use, so that’s a bonus. I’ve spent the past few years doing a number of side photography projects for friends, mostly just through word of mouth. Now that I’ve honed my craft more and have good equipment, I want to seek out jobs, especially with restaurants, food brands, and small companies. The past couple of years have revealed my true love for educating others, so I hope to continue finding ways to empower people to cook, entertain/host, and be intentional with their food purchases in 2017. My goal is to bring more predictability to my income this year and to double what I made in 2016. For my physical and mental health, I hope to find a more consistent pattern of exercise this year. That means scheduling my workout time in my calendar and sticking to it. It’s time for everything to find a place. And if it doesn’t have a place, it’s got to go! This is one of those YOLO goals that has been on my mind for years, but I’ve never done anything about it. Daily Duolingo sessions (5-15 minutes) are the game plan. I’d love to hear about your goals, and I’m open to suggestions for mine! Do you have any suggestions for Atlanta workout classes you recommend? Do you know of another great language-learning app? Let me know! GIVEAWAY DETAILS: Since I am shipping the book myself, the giveaway is only open to US residents. The contest is not endorsed by Instagram or Cultivate What Matters. The contest is open from Thursday, January 5th at 1:30pm ET until Sunday, January 8th at 11:59pm ET. To enter, follow me on Instagram @kenanhill and leave a comment on the contest photo tagging a friend and giving that friend a compliment. Only one entry per Instagram handle. Winner will be announced Monday, January 9th! *GIVEAWAY* My 2017 goal setting has been nothing short of inspired thanks to #powersheets and my accountability partner @ahpalmerton. I'm super excited to share a copy of this SOLD OUT goal planner! All you have to do is follow me (@kenanhill), tag a friend and give that friend a compliment. Let's start this year with more positivity! To read my eight () goals for this year and the full contest details, follow the link in my profile. A winner will be chosen at random on Monday 1/9!